MSM's IPO performance was just fantastic and way beyond many investors' expectations. Within the first few minutes of trading, it has already shot up by more than RM1, currently trading at RM4.58 at the time of writing this post. 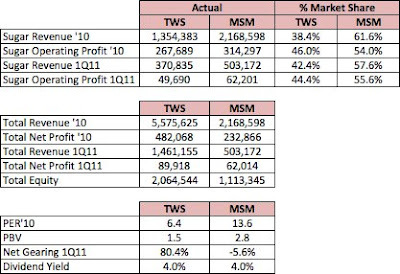 Looking at how good MSM has performed thus far, inevitably I would start looking at TWS, perhaps the only comparable company which is involved in sugar business in Malaysia. I've written a few posts before (Click here to view) and TWS still remains my favorite pick. Take a look at the tables below. As seen from the table above, the ratio of TWS:MSM in terms of revenue and profits from sugar division is approximately 40:60 to 45:55. 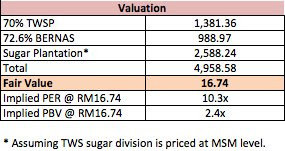 Therefore, should TWS' sugar division priced similarly to MSM, TWS' sugar business alone should be worth RM2.6 bil. And at this figure we have not even accounted for TWS' rice and oil palm plantation divisions. Based on TWS' 69.8% equity stake in Bernas and 72.6% equity stake in TWSP, both of them are worth RM0.99 bil and RM1.4 bil respectively at market price though I still think Bernas is undervalued and has further upside. In total, by adding TWS' 3 divisions i.e. rice, sugar and oil palm plantation, TWS should be worth RM4.96 bil or RM16.74 per share. At MSM price of RM4.50, PER and PBV are at 13.6x and 2.8x respectively, a lot pricier as compared to TWS. TWS' PER and PBV are at a paltry 6.4x and 1.5x respectively. Assuming a fair value of RM16.74 for TWS, TWS' PER remains at 10.3x only while PBV is at 2.4x at its fair value, which are still lower than MSM's!! Dividend yields for both companies are approximately the same at 4%. Besides the cheap valuation of TWS, TWS has extra advantage over MSM by having 3 strong divisions as compared to MSM's single business while TWS growth prospects are better as it is already owning huge tracts of oil palm plantation land which still have relatively young tree age and provide availability for new plantations. MSM's business is rather stagnant as the bulk of its business is limited to the Malaysian market and it would still need to make acquisitions and investments for expansions. In summary, TWS remains very undervalued as compared to MSM. and the strong debut of MSM should generate more interests in TWS. If your figures are right, TWS is indeed a much better value than MSM, especially TWS has proven its record as a public listed company for some time in comparison with MSM. figures are definitely important when compare, but I guess the other more important criterion is the integrity of the management. If the integrity of the one in-charge is dubious, whatever money the company makes will not become the property of the poor minority shareholders.